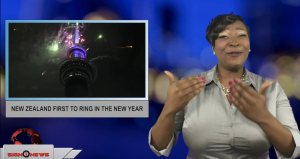 People all over the world will be ringing in the new year over the next couple of hours. In Auckland, New Zealanders were one of the first to celebrate 2019 at 6 AM this morning Eastern time. Two hours later at 8 AM Eastern time in Sydney, Australians lit up the sky with fireworks. Later tonight, Rome, Italy will bring in the new year at 6 PM Eastern time, London at 7 PM and, of course, at midnight New York City and everyone else on Eastern time will celebrate the start of a new year.